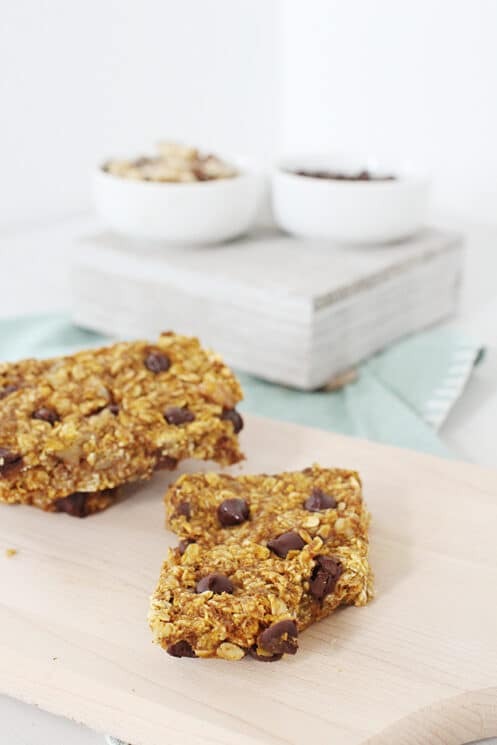 Super soft and chewy, healthy pumpkin bars with oats are delicious for breakfast with nutrition that will last your kids all morning! Sometimes kids will eat a food prepared in a specific way, but not another even though it has the same ingredients! Texture, flavor and visual presentation all have a big impact on kids acceptance of a food. 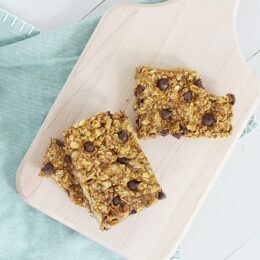 These pumpkin bars are really similar to a baked oatmeal, but they are just ‘packaged’ differently.. as a bar that is familiar for kids to eat and taste delicious! To make these, simply combine your oats with pumpkin puree, sweetener of choice (we used honey) and spices in a mixing bowl. Stir together and add chocolate chips at the end if you want! I think they taste really good with the chocolate since pumpkin and oats aren’t naturally sweet. It gives a little depth to the flavor. Press in an 8×8 pan and bake! If you like a thinner bar, you can use a 9×13 pan. Store in an airtight container for up to a week. Pumpkin is a deep orange color which tells us it is rich in nutrients and a great thing for kids to eat to get nutrition packed in a small amount of food. Vision- Pumpkin is a really good source of beta-carotene which converts to Vitamin A and is really important for good eye health and vision. Immunity- Because there is a large shot of Vitamin A in pumpkin, it can help boost your kids’ immune system and ability to fight infections and viruses. Skin- Vitamin A and C really help give you a boost in skin health. Carotenoids which pumpkin is high in have been shown to help prevent cell damage, premature skin aging and other skin diseases. Besides Vitamin A, pumpkin is also a great source of Vitamin C. Vitamin C helps form and repair red blood cells, bones, and tissues. It helps your child’s gums stay healthy and strengthens your child’s blood vessels, minimizing bruising from falls and scrapes. In addition, vitamin C helps cuts and wounds heal, boosts the immune system, and can help your child’s body get an infection . It also can help your child absorb iron. These pumpkin bars make a great grab and go breakfast and can be made ahead and stored for an even quicker option! We love the chewy texture of baked oats, and combined with nutrient packed pumpkin they are soft and easy to chew even for little toddlers who don’t have a lot of teeth! The oats and pumpkin both provide a really nutrient dense bar that is a great portable breakfast option when you have those mornings where you are in a big hurry. There are only a few ingredients which make it a great option if you have food allergies in your home. There is no dairy, no gluten (if you use gluten free oats) and no eggs! 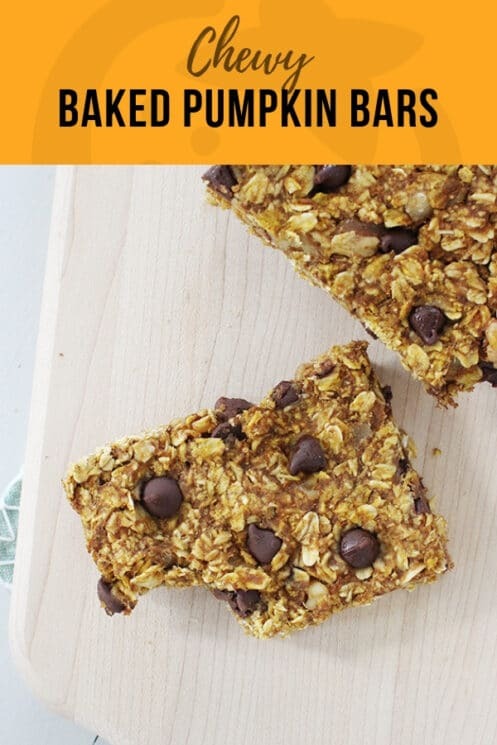 Give these a try for breakfast or even to pack in a lunch or an after school snack! You can also include other add-ins like dried fruit, coconut, or chopped nuts. Yum! Spray an 8×8-inch baking dish with cooking spray. Preheat oven to 350 degrees F.
Combine all ingredients in a mixing bowl; stir well. Press into prepared baking dish. Bake for 18-20 minutes until the top is golden and it is firm to the touch. Let cool, and slice into bars. These look delicious, and so simple! I am definitely pinning this to try later. Thanks for the recipe! Can you suggest some add in combos? I am not good at that! 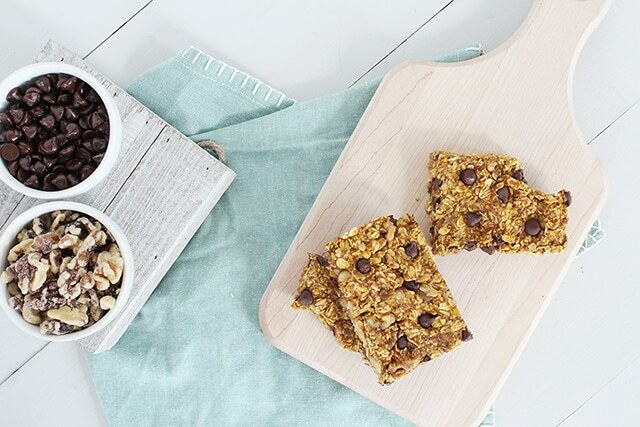 Some of our favorites are chocolate chips, dried fruit, coconut, or chopped nuts! What would you substitute instead of the honey? I work in a childcare center and so honey is not allowed via our food program until they are over 2yrs. Try maple syrup or brown rice syrup! I have trouble when I see a recipe that asks for oats determining the kind..is this recipe quick cook oats or thick rolled oats? I have actually ruined recipes by just guessing. Really want to try this out for my super picky 5 year old. What type of oats do you use for this recipe? Quick cooking or rolled? I followed the directions you provided to the letter and I am sorry to say the bars were inedible. The oats were still partially raw even though I left the bars in the oven a bit longer than the time you suggested. For the pumpkin spice – is it 1/2 tsp or 1/2 tbsp? Hi! Is it 1/2 tsp or 1/2 tbsp of pumpkin spice? I have never tried freezing them, but if you try it let us know how they turn out! Hi. So do old fashioned rolled oats work in this recipe or does it have to be quick oats? I plan to bake these tomorrow afternoon so would love to know the type of oats used. Thank you! You can use either, but old fashioned are just much more chewy. We found we liked the consistency better with quick oats. Thanks! I did make them with old fashioned oats & they turned out pretty good but did buy quick oats too so I will make the next batch with them! I added some chopped pecans & walnuts (1/2 cup) & a handful of chocolate chips. Yummy! What substitute can I use for the canned pumpkin? Would butternut mash work? It may have a little more liquid than canned pumpkin, but you could definitely give it a try! 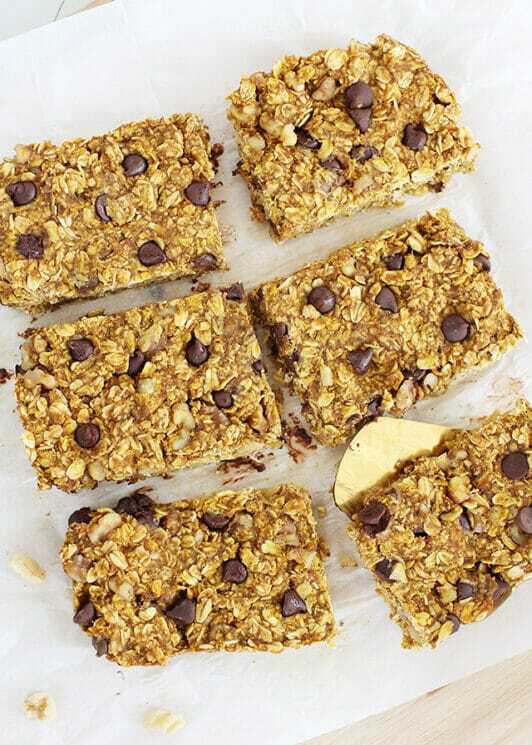 These are definitely more baked oatmeal than bar. 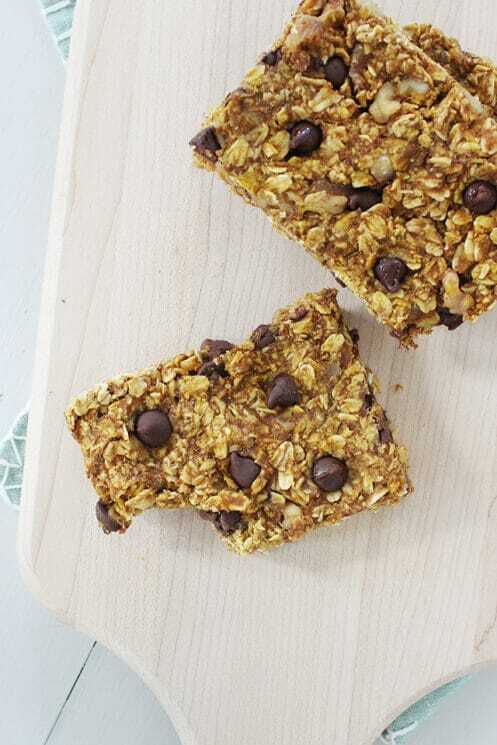 If you’re thinking of making them as a grab and go snack, it won’t work, unless you cut them into 16 small bars. I cut them into 8ths and it fell apart on me. Thanks for your feedback on these! Are those nutritional values accurate? Seems like a lot of calories and sugar per serving to be considered healthy. What is a serving? How many squares are you supposed to cut it into? Great taste and very soft/chewy. The only modification I made was to use some corn syrup for about half the honey because I’ve had bad experiences in the past of honey not holding a snack together very well. I found these quite tasty but a little dry. Went down well with one of my kids, but not the other. Both of my kids liked these. I omitted the nuts. This recipe looks so delicious. But I have a question, if it’s healthy for my child who is struggling with weight. The carbs that turn to sugar are so high compared to protein. Thoughts? Kids still need carbs – it is a really good idea to balance with something that has protein has well so they will stay fuller longer. Yep! You can sub pumpkin seeds!